In music videos, VJ-ing and Graphic Recording visual answers are found to that which is audible. Something similar happened when students of The University of Arts Berlin, the Bauhaus University Weimar and the German University Cairo worked artistically with film in a mini-Hörspiel format "Wurfsendung": How can you relate visually to ultra-short radio pieces? Do you pick up rhythms or do you counteract them? Do you want to illustrate, abstract or contrast? Explore these questions and document your answers in notes. Drawn, painted or written. Julia Tieke, works with "text, sound & around". Writes features and adaptations for radio plays, has been project director of the mini-radio play format "Wurfsendungen" at Deutschlandradio Kultur since 2007. She focuses on the countries in the Middle East, especially Egypt. 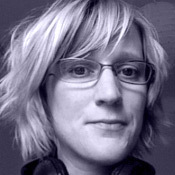 She hosts the blog "Cairo by Microphone" and in 2012 designed and conducted the "Alexandria Streets Project" (with Berit Schuck) that included a "sonic map" of the Egyptian port city as well as a "Mini Radio Academy". Lives and works in Berlin.